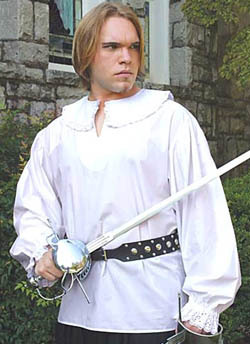 This late period renaissance shirt pairs perfectly with the Muskateer Tabard. The lace collar and billow sleeves allow you to pair with a variety of period outfits. This shirt will give you years of practical use. Neck 14" - 15.5" 16" - 17.5" 18" - 18.5"
Chest 34" - 40" 42" - 48" 50" - 52"
Waist 28" - 34" 36" - 42" 44" - 46"
Sleeve 32.5" - 34" 34.5" - 36" 36.5" - 37"